After losing last Friday night at home against Bryant—recording just four hits—Maryland salvaged the weekend by winning the next two games behind a pair of strong starts from sophomore left-hander Tyler Blohm and junior right-hander Hunter Parsons. But after jumping out to a six-run lead Tuesday against Delaware, the Terps surrendered seven unanswered runs as they fell to the Blue Hens for the second straight week. Coming off that tough midweek loss, the Terps’ (9-7) road doesn’t get any easier, as they travel to Greenville, North Carolina, to take on No. 18 East Carolina (13-4). Ranked since Feb. 26, The Pirates moved up even higher after going 4-0 last week. Parsons continued his successful emergence as the Sunday starter last weekend for the Terps, throwing his first career complete game against the Bulldogs. He allowed 10 hits, but battled through jams and minimized damage to only allow two earned runs. He also only issued one walk. Since allowing eight earned runs in his first inning of the season, Parsons has allowed just five in his last 22 innings (2.05 ERA). Out of the bullpen, two-way player Kevin Biondic’s 1.12 ERA continues to lead the relievers. The right-hander is holding hitters to a slim .107 average in eight innings pitched the season. The only earned run he’s conceded this season was on a home run against Coastal Carolina. His eight innings pitched trails just closer John Murphy, who owns a 3.24 ERA in 8.1 innings of relief. Murphy received the loss Tuesday as the Blue Hens walked off to win, but the right-hander is still holding opposing hitters to an abysmal .080 average. Right-handed reliever Mike Vasturia is quietly putting up solid numbers out of the bullpen as well. He allowed just one hit in two scoreless innings Tuesday against Delaware, lowering his ERA to 1.35. Murphy received the loss Tuesday, as the Blue Hens walked off to win, but he’s still holding opposing hitters to an abysmal .080 average. The Terps offense has been inconsistent ever since sweeping the Johnny Gardner Law Group Tournament two weekends ago. Maryland had 29 combined hits in the last two games of the Bryant series, but also left 12 runners on base in the first game against Delaware, had just one hit Friday night against Bryant and just four hits in its most recent loss to the Blue Hens. Second baseman Nick Dunn continues to be the most consistent hitter for the Terps, leading the team in nearly every category, including batting average (.345), slugging percentage (.690), on base percentage (.473), runs scored (16), hits (20), doubles (5), home runs (5) and RBIs (18). Center fielder Zach Jancarski, whose .295 average is second on the team, earned the No. 5 spot on SportsCenter’s top plays with this diving grab on Tuesday. Welcome to the @SportsCenter Top-10, @ZachJancarski7! The rest of the team is still looking to break out, as Will Watson, Justin Morris and Marty Costes are among the regulars hovering below the .200 mark for the year. Costes has struggled mightily early on this season, but has showed signs of life recently, collecting hits and RBIs in the last two contests. East Carolina didn’t earn a trip to the NCAA Tournament for just the fourth time in the last 17 years last season, but is off to a great start in 2018. The Pirates have been ranked for the last three weeks, in large part due to earning a pair of quality wins over then-No. 6 North Carolina. East Carolina’s pitching staff held the Tar Heels to just six runs in three games during that series. The Pirates, though, struggled in each of their two midweek games this week. 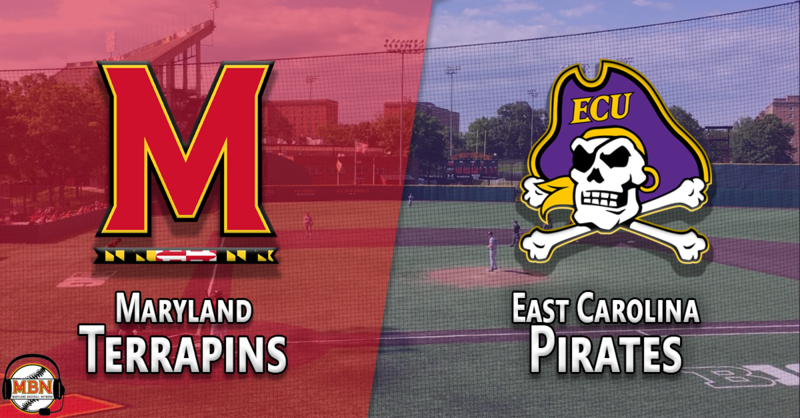 Tuesday against VCU—a team Maryland beat earlier this season—East Carolina was shut out, 3-0, and recorded just three hits. On Wednesday against Elon, it took a walk-off sacrifice fly to come away with a victory. The Pirates had just four hits. East Carolina’s 2.29 team ERA is the 11th-best in the country, led by returning starters sophomore Trey Benton and junior Chris Holba. The pair of consistent weekend starts have combined for a 1.43 ERA, allowing just eight earned runs in over 50 innings this season. They’ve also struck out 58 hitters while walking just five. Three other Pirates pitchers—Alec Burleson, Tyler Smith, and Ryan Ross—have each thrown more than 10 innings, but have allowed no more than one earned run this season. Those pitchers combined have an 0.43 ERA in just under 40 innings this season. Although they have smaller roles, East Carolina has another set of of three pitchers with five or less innings without allowing an earned run. Offensively, the Pirates have had three hitters stand out in the lineup through 17 games this season. Redshirt sophomore catcher Jake Washer hit .133 last season, but is leading the team this spring with a .432 average, including six multi-hit games. Junior infielder Brady Lloyd—batting .395—has 17 hits this season, three more than he had in his first two seasons combined. Sophomore Spencer Brickhouse leads East Carolina with four homers and 15 RBIs. East Carolina is hitting .280 as a team, averaging 6.1 runs per game. The Pirates offense has been very good at stealing bases, as 22 of 29 attempts have been successful. Six different players have at least two steals this season. Also showing an aggressive nature, East Carolina draws just over four walks per game; the Terps draw nearly six per contest. After beginning the season with a stretch of strong starts, Taylor Bloom’s last outing last week against Bryant was a little below the senior’s standards. He had his shortest start of the season last weekend against Bryant, allowing four runs on six hits with three walks in 5.2 innings. The right-hander has given the Terps length otherwise, however, going at least seven innings in his other three starts, and he leads the team with 27.2 innings pitched. Bloom will look to get back to his earlier-season form against a good Pirates offense. Trey Benton has been strong so far this season in the Pirates rotation, taking a big step forward from his freshman campaign a year ago. He started in all 14 of his appearances last season with a 4.18 ERA. This year, though, he’s allowed just six earned runs in his first 25 innings. Benton is coming off his best career start last weekend against Charlotte, allowing one earned run on five hits in 8.1 innings. He struck out six and walked just two. He’s pitched at least five innings in all four of his starts. Tyler Blohm is coming off a start in which he allowed four earned runs in six innings while allowing nine hits. He struck out five and walked just one against Bryant in that start. It surely wasn’t his strongest outing of the season, but he’s pitched well away from home this season. He earned a win against then-ranked Coastal Carolina two weekends ago when he conceded just two runs in six innings while striking out seven hitters. The left-hander leads Maryland starters in ERA and opponents’ average (.227). Chris Holba improved a 6.23 ERA as a freshman to a 3.38 ERA as a sophomore, and that trend has continued into his junior season. The right-hander began the season as the Sunday starter but has already moved up in the rotation. He’s unbeaten in his four starts this season, and while wins aren’t always indicative of a pitcher’s performance, his are legitimate. Holba has allowed just two runs just in 25.1 innings with 30 strikeouts and three walks. He allowed both those runs in his last start against Charlotte, snapping a 24-inning scoreless streak to open the year. Hunter Parsons has continued to get better with each and every start this season, but it’ll be hard to top the performance he had last weekend against Bryant. The junior right-hander tossed his first-career complete game in a back-and-forth 5-3 win for the Terps. He allowed double-digit hits, but powered through jams to get outs when he needed them most. Parsons has worked quickly and with control, walking just one batter in each of his last two starts, and needing just 102 pitches to go the distance last week. He has also allowed just five earned runs in his last 22 innings (2.05 ERA), and lowered his ERA by two runs alone in his last start. 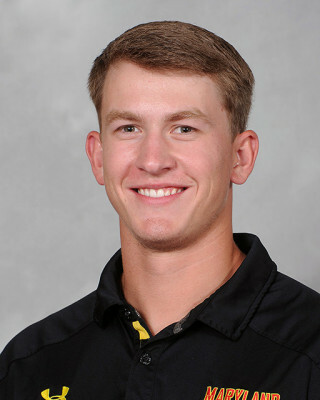 Sophomore right-hander Tyler Smith made his first four appearances of the season out of the Pirates bullpen, allowing just one run in 11.2 innings. He made his first start of the season last weekend in the second game of a doubleheader in a win against Charlotte. He didn’t allow a run in six innings of work, conceding just three hits. He struck out three and walked just one batter. On the entire season, Smith has allowed just one run in 17.2 innings. He’s not a big strikeout pitcher, setting down just six hitters on strikes.